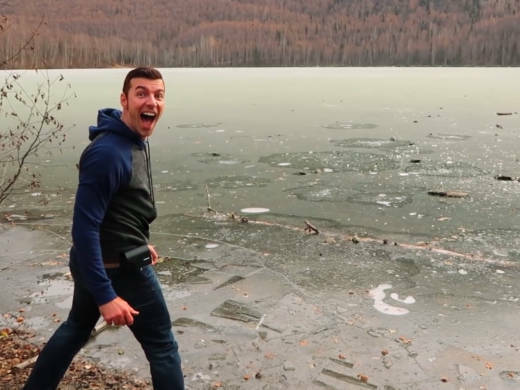 YouTuber Cory Williams reacts to the strange sound made by his local frozen lake. Cory Williams discovered this natural phenomenon back in 2014, when he moved from California to Alaska. He tried skipping rocks across the icy surface of Edmonds Lake, just up the road from Anchorage. His YouTube video of the space age twanging that ensued was viewed 11 million times. This year, Williams returned to Edmonds Lake and made another discovery. The lake was singing on its own. Why? And how? The latest video from Skunk Bear, NPR's science youtube channel, reveals the origin of that iconic sci-fi sound effect and explains why it can be heard every year in the frigid wilds. Got your own science-y questions for us? Use this form to send them our way. We'll do our best to answer on Skunk Bear's YouTube channel. You can follow Cory Williams' Alaskan adventures on his YouTube channel, LiveEachDay.